The following explanation of the “Flash Crash” on May 6, 2010 is from “FINDINGS REGARDING THE MARKET EVENTS OF MAY 6, 2010″. On May 6, 2010, the prices of many U.S.-based equity products experienced an extraordinarily rapid decline and recovery. That afternoon, major equity indices in both the futures and securities markets, each already down over 4% from their prior-day close, suddenly plummeted a further 5-6% in a matter of minutes before rebounding almost as quickly. Many of the almost 8,000 individual equity securities and exchange traded funds (“ETFs”) traded that day suffered similar price declines and reversals within a short period of time, falling 5%, 10% or even 15% before recovering most, if not all, of their losses. However, some equities experienced even more severe price moves, both up and down. Over 20,000 trades across more than 300 securities were executed at prices more than 60% away from their values just moments before. Moreover, many of these trades were executed at prices of a penny or less, or as high as $100,000, before prices of those securities returned to their “pre-crash” levels. By the end of the day, major futures and equities indices “recovered” to close at losses of about 3% from the prior day. May 6 started as an unusually turbulent day for the markets. As discussed in more detail in the Preliminary Report, trading in the U.S opened to unsettling political and economic news from overseas concerning the European debt crisis. As a result, premiums rose for buying protection against default by the Greek government on their sovereign debt. At about 1 p.m., the Euro began a sharp decline against both the U.S Dollar and Japanese Yen. Around 1:00 p.m., broadly negative market sentiment was already affecting an increase in the price volatility of some individual securities. At that time, the number of volatility pauses, also known as Liquidity Replenishment Points (“LRPs”), triggered on the New York Stock Exchange (“NYSE”) in individual equities listed and traded on that exchange began to substantially increase above average levels. By 2:30 p.m., the S&P 500 volatility index (“VIX”) was up 22.5 percent from the opening level, yields of ten-year Treasuries fell as investors engaged in a “flight to quality,” and selling pressure had pushed the Dow Jones Industrial Average (“DJIA”) down about 2.5%. Furthermore, buy-side liquidity3 in the E-Mini S&P 500 futures contracts (the “E-Mini”), as well as the S&P 500 SPDR exchange traded fund (“SPY”), the two most active stock index instruments traded in electronic futures and equity markets, had fallen from the early-morning level of nearly $6 billion dollars to $2.65 billion (representing a 55% decline) for the E-Mini and from the early-morning level of about $275 million to $220 million (a 20% decline) for SPY.4 Some individual stocks also suffered from a decline their liquidity. At 2:32 p.m., against this backdrop of unusually high volatility and thinning liquidity, a large fundamental5 trader (a mutual fund complex) initiated a sell program to sell a total of 75,000 E-Mini contracts (valued at approximately $4.1 billion) as a hedge to an existing equity position. Generally, a customer has a number of alternatives as to how to execute a large trade. First, a customer may choose to engage an intermediary, who would, in turn, execute a block trade or manage the position. Second, a customer may choose to manually enter orders into the market. Third, a customer can execute a trade via an automated execution algorithm, which can meet the customer’s needs by taking price, time or volume into consideration. Effectively, a customer must make a choice as to how much human judgment is involved while executing a trade. This large fundamental trader chose to execute this sell program via an automated execution algorithm (“Sell Algorithm”) that was programmed to feed orders into the June 2010 E-Mini market to target an execution rate set to 9% of the trading volume calculated over the previous minute, but without regard to price or time. The execution of this sell program resulted in the largest net change in daily position of any trader in the E-Mini since the beginning of the year (from January 1, 2010 through May 6, 2010). Only two single-day sell programs of equal or larger size – one of which was by the same large fundamental trader – were executed in the E-Mini in the 12 months prior to May 6. When executing the previous sell program, this large fundamental trader utilized a combination of manual trading entered over the course of a day and several automated execution algorithms which took into account price, time, and volume. On that occasion it took more than 5 hours for this large trader to execute the first 75,000 contracts of a large sell program. However, on May 6, when markets were already under stress, the Sell Algorithm chosen by the large trader to only target trading volume, and neither price nor time, executed the sell program extremely rapidly in just 20 minutes. 7additional 1.7% in just these 15 seconds, to reach its intraday low of 1056. This sudden decline in both price and liquidity may be symptomatic of the notion that prices were moving so fast, fundamental buyers and cross-market arbitrageurs were either unable or unwilling to supply enough buy-side liquidity. In the four-and-one-half minutes from 2:41 p.m. through 2:45:27 p.m., prices of the E-Mini had fallen by more than 5% and prices of SPY suffered a decline of over 6%. According to interviews with cross-market trading firms, at this time they were purchasing the E-Mini and selling either SPY, baskets of individual securities, or other index products. By 2:45:28 there were less than 1,050 contracts of buy-side resting orders in the E-Mini, representing less than 1% of buy-side market depth observed at the beginning of the day. At the same time, buy-side resting orders in SPY fell to about 600,000 shares (equivalent to 1,200 E-Mini contracts) representing approximately 25% of its depth at the beginning of the day. Between 2:32 p.m. and 2:45 p.m., as prices of the E-Mini rapidly declined, the Sell Algorithm sold about 35,000 E-Mini contracts (valued at approximately $1.9 billion) of the 75,000 intended. During the same time, all fundamental sellers combined sold more than 80,000 contracts net, while all fundamental buyers bought only about 50,000 contracts net, for a net fundamental imbalance of 30,000 contracts. This level of net selling by fundamental sellers is about 15 times larger compared to the same 13-minute interval during the previous three days, while this level of net buying by the fundamental buyers is about 10 times larger compared to the same time period during the previous three days. At 2:45:28 p.m., trading on the E-Mini was paused for five seconds when the Chicago Mercantile Exchange (“CME”) Stop Logic Functionality was triggered in order to prevent a cascade of further price declines. In that short period of time, sell-side pressure in the E-Mini was partly alleviated and buy-side interest increased. When trading resumed at 2:45:33 p.m., prices stabilized and shortly thereafter, the E-Mini began to recover, followed by the SPY. The Sell Algorithm continued to execute the sell program until about 2:51 p.m. as the prices were rapidly rising in both the E-Mini and SPY. 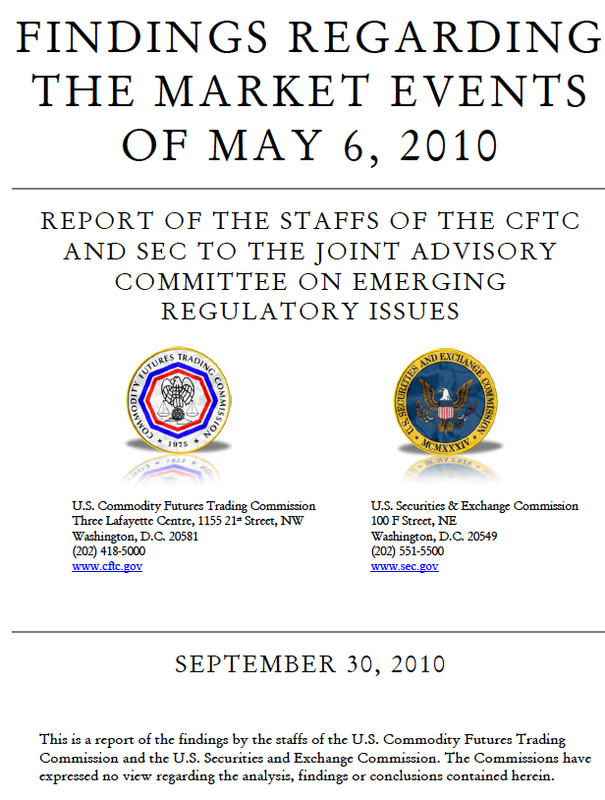 To learn more, read: “FINDINGS REGARDING THE MARKET EVENTS OF MAY 6, 2010″.